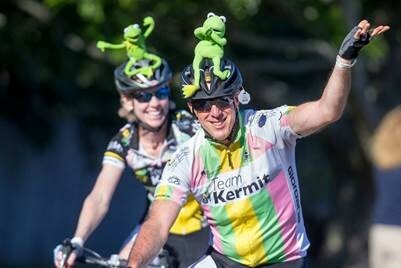 I am honored to ride with Team Kermit in memory of Jared Branfman. Team Kermit was formed in 2005 while Jared was undergoing treatment at the Jimmy Fund and doing bicycle repairs from a wheelchair. The team is named for Kermit the Frog of Sesame Street fame - Kermit was one of Jared's favorite childhood characters and represents the ability that people have to rise above the ordinary in order to achieve great results. Kermit's theme It's not easy being green became Jared's mantra and helped him endure and even laugh through often grueling treatments. Although I never had the privilege of meeting Jared personally, I’m told that Jared was the epitome of determination, resolve, dedication, bravery, and passion. Kermit inspired Jared and reminded him that we are limited only by our own dreams and desires. In September 2005, Jared passed away after a 2½ year battle with the disease. He was 23 years old. In 2006 the Jared Branfman Sunflowers For Life Fund For Pediatric Brain And Spinal Cancer Research was established at the Jimmy Fund. All the money raised by Team Kermit goes through the PMC and into this fund. It supports research into the type of disease that Jared had and is helping to make the dream of no more cancer a reality. It is a fitting legacy to Jared's wish to help others.